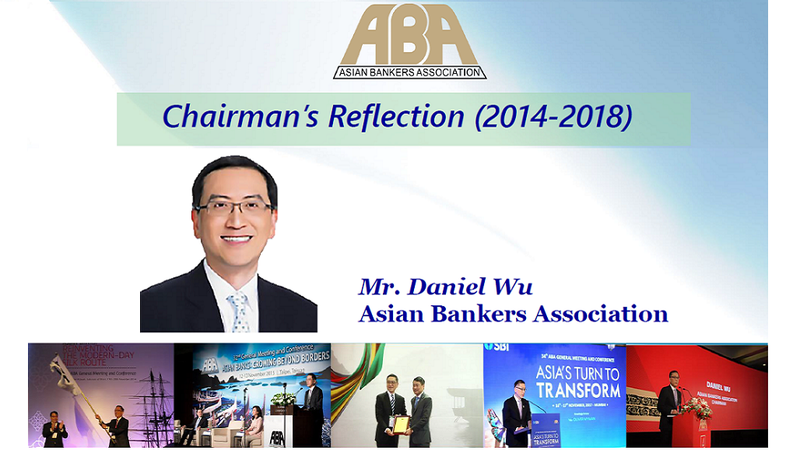 The Asian Bankers Association is pleased to share with its members the Chairman’s Reflection (2014-2018) summarizing the activities undertaken by Immediate Past ABA Chairman and current Advisory Council Chairman Mr. Daniel Wu during his four-year term from 2014 to 2018. On behalf of Mr. Wu, the ABA would like to take this opportunity to thanks all its members for the cooperation and assistance extended to him in undertaking the projects and programs he initiated during his Chairmanship. Without your help, Mr. Wu would not have accomplished what he had set out to do to when he first took over the helm of ABA in 2014. We look forward to your continued support of the ABA and its activities in the years ahead under the incumbent ABA officers and Board members – led by ABA Chairman Mr. Jonathan Alles, Managing Director and CEO of Hatton National Bank from Sri Lanka – and we hope to see you and your colleagues in future ABA gatherings.